With the recently elected Syriza government in Greece being held to ransom by European banks, and the massive gains made by parties affiliated to Podemos in Spain recently, the left has an enormous opportunity throughout Europe. Support for the old Labour-style parties is crumbling after decades of betrayals. In Britain the Iraq war hangs heavy over the Labour party with many of their core voters deserting them. It is crucial that the left in Britain get their act together and provide a real alternative to the austerity offered by the traditional parties, otherwise right-wing racists like UKIP will benefit even more. In our meeting on Wednesday we will be discussing what a Socialist government would be like, what we mean by ‘socialism from below’ and how we can build the left in Britain. 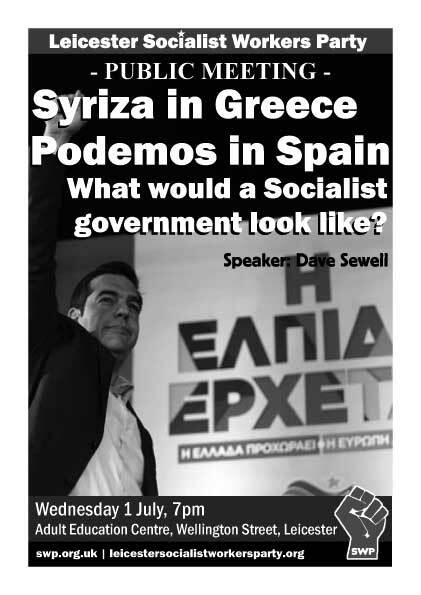 Dave Sewell, a journalist at Socialist Worker, will be speaking, after which we will have a discussion. The meeting is on Wednesday 1 July, 7pm at the Adult Education Centre (opposite Fenwicks). All welcome. 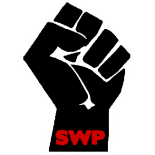 This entry was posted on Jun 28, 2015 by leicestersocialistworkersparty in Meetings, Uncategorized.